New York has no shortage of superior pierogi spots -- from Veselka, 24-hour bastion of post-drinking food, to Karczma, the Polish stalwart in Greenpoint, the city is pretty well covered when it comes to the traditional Eastern European dumplings. The same is true of solid macaroni and cheese options. But there’s only one place in New York that had the foresight to combine the two. On a quiet corner of Gowanus (far enough from the canal to dodge the smell), sits Baba's Pierogies. On weekends, the restaurant's inviting light-wood tables are always packed with young kids and hungover adults alike, both groups stuffing their faces with a steady stream of handmade pierogies. While all eight filling options on the menu are worth trying -- including the potato and jalapeño varieties -- the obvious winner is the macaroni and cheese-stuffed dumplings. Baba's doesn't skimp on the filling, and each order comes with five pierogies (for just $8.50) brimming with what is essentially a grown-up version of everyone's favorite Kraft Dinner. I’d probably eat several bowls of the pasta -- made stovetop style with plenty of American -- on its own, but the doughy pockets it sits inside adds a whole other level to eating it. 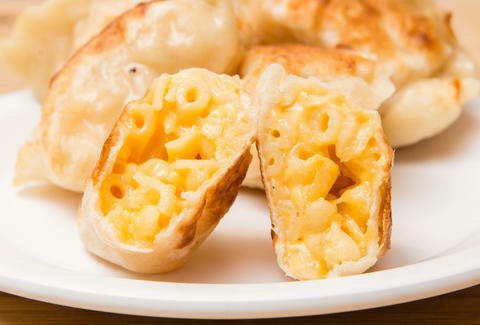 Think of the pierogies as a vessel for even quicker mac & cheese consumption. Sure, you can get your order boiled and they will be good, but these pierogies were meant to be eaten fried. The pan frying gives the skin a crispy texture that perfectly counterbalances the creamy mac & cheese; it’s like the best parts of baked mac & cheese without the mess of bread crumbs. And while hot sauce or ketchup might be your standard mac & cheese accoutrements, the move at Baba’s is to smear each pierogi with cold sour cream. It might sound odd, but the end result is anything but: The tangy sour cream expertly cuts through the fattiness of the pasta, and will have you looking for another $8.50 so that you can get another order to go.